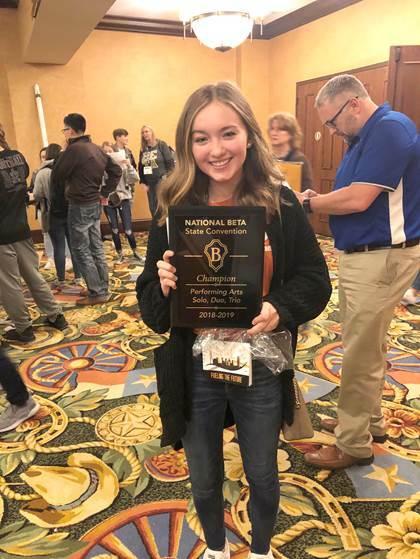 North Lamar High School Beta Club advanced to nationals after Merideth Puckett placed first in the Performing Arts Solo competition at the Beta State Convention on February 1-2 at The Gaylord in Grapevine, Texas. The North Lamar sophomore sang Feeling Good, which secured her a spot at the national convention on June 19-22 at the Cox Center Convention in Oklahoma City, Oklahoma. NLHS Beta sponsor is Whitney Blount.